Use this powerful process to open the floodgates of Divine Wealth and Abundance to you in less than 30 minutes. Financial abundance is not something you have to prove yourself worthy of through hard work and sacrifice. It’s not something you have to earn or prove you’re worthy of. And it’s certainly not only meant for the lucky few. Prosperity is your Divine birthright. But if money has been a struggle, you may have inadvertently pinched off the flow of all kinds of abundance to you based on what you’ve observed, what others have told you or through hard life lessons. I know because for the longest time I tried All. The. Things. to create more money and abundance in my life. I read dozens of books. I took course after course. I wrote out and repeated affirmations every day. Your Divine Wealth and Abundance can’t flow to you if your prosperity pipeline is clogged up with sh*t.
But the Truth is that until you get out of your own way and align yourself at the deepest levels with your Divine Wealth and Abundance, you simply can’t receive all that you’re meant to have. If you’ve been working on creating more wealth, you’ve probably taken more than a few manifestation courses, listened to countless “money experts” talk about how to create more money, and feel like you’ve tried just about everything to open the tap of financial abundance in your life. But although things may have gotten a little better - you may have even had some significant wins here and there - you want much, much more. Adding team members to your business so you can finally stop working 24/7…. And it’s not like you’re not already trying really hard to bring more money in the door. But up to this point, things just haven’t “clicked” and money isn’t flowing in like you want or need it to. You have the feeling that if you could just find that missing piece… if you could finally break through the invisible block standing between you and the abundance that you know you’re meant to have… then the money would start to flow like a rushing river into your life. Whether you’re stuck in frustrating money patterns that you can’t seem to break free of or you simply want to attract more money and wealth of all kinds, now is the time for you to reclaim what’s rightfully yours: a life of overflowing prosperity, freedom and joy! Most people (and maybe you) believe that to create more money in your life, you have to focus on the money itself. Money manifestation courses and financial coaches will tell you to set your big money goal because you’ve gotta have a goal to strive for, like how much money do you want to make each year or how big of a lump sum of cash do you need? You should focus on that. Seems to make sense, doesn’t it? But after a few weeks… or months… or years… the money still hasn’t shown up. Or your situation has gotten slightly better, but nothing close to what you wanted it to be. That’s because most money manifesting courses and practices unintentionally set you up for frustration and failure. And, doing these kinds of things will most likely help you start shifting the way you think about money, so you may end up a little better off than you were before. … Because if after taking these money manifestation courses and doing things like writing out your money attraction affirmations 100 times (yes, I did that for one program! ), journaling until your hand goes numb, and making your 25th treasure board, the money still hasn’t shown up, I bet you’re feeling so frustrated you want to scream. “What gives?!? !” I can hear you shouting. I hear ya! I’ve been there and done that. After more four-letter-word-slinging, angry, ugly-crying-while-venting-my-frustrations-about-money sessions with myself than I care to share, I discovered that there’s a huge flaw in what almost every money abundance program teaches…and it keeps you from actually creating the money you want! They tell you to focus on creating your big money goal itself - as in the amount of dollars in the bank - and do NOT show you how to align with and act from the version of you that is free of your “money junk” and swimming in soul-aligned opportunities for you to create the money, receive it and constantly up-level your wealth here in “real life”. When you place your intention and attention on manifesting, say, $50,000, where’s your focus? On the $50k, right? But how do you actually GET the $50k? How’s it going to come to you? #3 - Takes advantage of the most soul-aligned ways in which it can come to you here on the physical plane (i.e., via “real life” people and events) while expanding your ability in the here and now to receive (and keep) all the forms of money, wealth and abundance that come in. The money is going to come to you via the people you meet, the opportunities that show up and the choices you make. So wouldn’t aligning yourself with not only the amount of money you want to create but, even more importantly, the right people, opportunities and choices that naturally lead to you receiving the money you desire make creating amazing financial abundance so much easier? Yes, of course it would! The Divine Wealth and Abundance Activation energetically aligns you with your divinely rich self to call into your life real-world money opportunities right now. The process you’ll be guided through is far more than your average money meditation or visualization. And it’s certainly not just a series of positive affirmations. You must activate it at the highest energetic levels, embed it in your subconscious at the deepest levels, and align with receiving it here on the physical plane, too! When you do all three of these things, you’ll naturally find yourself attracted to the right-and-perfect pathways for money to flow to you and you’ll be there with open arms to take it in. Plus, you’ll stop making poor, disempowering money choices because they simply won’t “fit” with you any longer. Imagine the relief you’ll feel when you finally getting off the roller coaster of having some money come in… only to see it quickly slip through your fingers once again. True Divine Wealth and Abundance isn’t something you have one day and not the next. It isn’t a fleeting moment of prosperity that’s here one moment and gone tomorrow. And it isn’t something that you can ever not be in once you embody it fully. True Divine Wealth and Abundance is a permanent state of being aligned with and tapped into all the ways in which the abundance of the Universe can manifest in your life right here and now. Are you ready to have yours? Ready to claim your Divinely wealth and rich life now? You’ll be guided through a unique process to clear out disempowering patterns, energies and habits that are keeping your financial prosperity and abundance at bay. This process is unlike any other clearing process you may have tried before! You’ll align at a soul level with Highest Version You that already has what you desire… and then ground that energy into your current, physical reality. What is the Divine Wealth and Abundance Activation audio like? No janky, crackling audio here! This is a professionally recorded audio process featuring a unique process and professional music designed to carry you into a state of profound receptivity where the transformation process can work at both the deepest levels of your subconscious mind and highest levels of your Divine Self. Have a listen to the compilation of excerpts from the process - just click below! You can even download the clip if you’d like to. + How long is the audio? 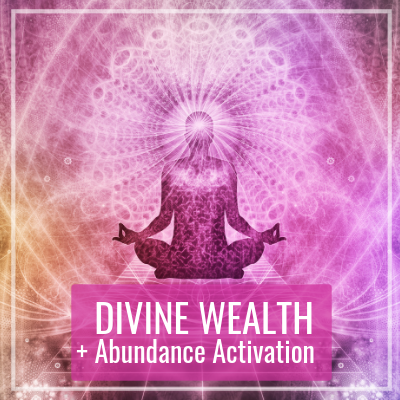 The Divine Wealth and Abundance audio includes an important 8-minute introduction and the activation process audio (track 2) is just under 28 minutes long. You’ll activate more joy, fun, freedom and financial prosperity in your life by shifting and clearing unsupportive beliefs and energetic patterns, aligning your energy with what you desire to call in, and connecting with the highest version of your who already has the financial wealth and expressions of abundance you desire to call into your current reality. + How do I access the audio? A few minutes after you complete the check-out process, you'll receive an email from me, Christine Parma, from the email address Team@ChristineParma.com. Instructions on how to download your MP3 audio, plus important information about how to get the most from the activation, are contained in this email, so please be sure to read it! If you don't see it in your inbox or Gmail Primary tab, please check your junk or spam folder and/or your Gamil promotions tab. Please allow up to 15 minutes for the email to arrive in your inbox. + Will this audio activation work for me? This process was channeled directly from the Akashic Records (aka, Book of Wisdom or Soul Records) and is a process unlike any other you may have experienced or will find. Not only is the process itself unique, combining elements and techniques from the Records, NLP and hypnosis (which are some of the methodologies I use in my client work), the audio is imbued with the energy from the Akashic Records themselves. Rest assured that all energy and information coming from the Records is always Truth, Light and Love - and extremely powerful! It is totally normal to feel "whooshes" or rushes of energy, strong emotions, an amazing lightness or experience profound healing and insights every time you listen to the process and in the days that follow. So, YES, this audio will work for you if you are open to allowing what needs to change to do so during the activation (and in the days thereafter) in order for you to create a different outcome (reality) than the one you're currently experiencing. Remember that even seemingly small changes can amount to profound transformation in what your life looks like. I liken it to when you're flying a plane, for instance. Changing your route by one degree may mean you land in Seattle instead of Los Angeles. Big difference from a tiny change! Going through this process may result in a one degree shift or a twenty or fifty degree shift - it will be unique to you! + Do you guarantee results? I fully stand behind all the work I do and the quality of the products I create. However, since I have made the audio extremely affordable and it's a fully downloadable product, no refunds are available after purchase at this time. + Why should I invest in this now? I'm kind of busy. The only reason to invest your time and money into getting this life-changing process is because you want your life to be different... and a lot sooner rather than later. That's really the only reason to invest in anything: to get different results than what you're currently getting. You can tell what someone's priorities are by looking at how they spend their time, energy and money. And, if you're too busy to invest less than 30 minutes into clearing out what's blocking your divine wealth and abundance from flowing to you, plus a bit more time to take the practical follow-up steps you're very likely to get insight on as a result of doing this process, then, in all honesty, changing your life and the kind of results you're getting probably isn't really a true priority for you. And, that's okay... but it's a choice you're making (that you may not even be aware of).